This past winter I decided to make my own maple syrup for the first time. On a snowy March morning, my girlfriend and I drove out to an old woodland in northwest Philadelphia and tapped a single large sugar maple. I couldn't believe it was so easy for someone living in a city. All we'd had to do was find a large enough sugar maple and obtain permission to tap it, and a few days later there we were with two gallons of sap! It also turns out to make a great cheap date. We had been reading about the fascinating indigenous history of maple sugaring, as well as figuring out how to boil it down without destroying our kitchen. But in the midst of doing research at home, I was surprised to find out something else: we may not be able to make maple syrup for much longer. A classic cold-climate species, sugar maple (Acer saccharum) is threatened by climate change, and with it the half-billion dollar maple syrup industry. Already disappearing from cities, where it has long been planted as a street and yard tree, it is now also threatened in its native forest habitat. Supporting around 90 species of moths and butterflies, it is also a vital foundation for biodiversity in northern hardwood forests. The forests of New England are projected to lose most sugar maples and birches, and shift toward an oak-pine forest type more typical of the South and Mid-Atlantic. Can Assisted Migration Save the Sugar Maple? Acer barbatum (syn. Acer saccharum var. floridanum) - the Southern sugar maple, growing as far south as Texas and Florida. It can hybridize freely with northern sugar maple, potentially imparting traits adapted to high-heat. Acer saccharum ‘Caddo’ - the Caddo sugar maple, an ecotype of Acer saccharum or Acer barbatum from Oklahoma that is highly tolerant of heat, drought, and alkaline soil - making it well adapted for cities. Like southern sugar maple, it can hybridize freely with Acer saccharum. Acer skutchii - a sugar maple that has evolved separately for 9,000 years in Mexico after being separated from the rest of the species, and is adapted to a mountainous subtropical environment. 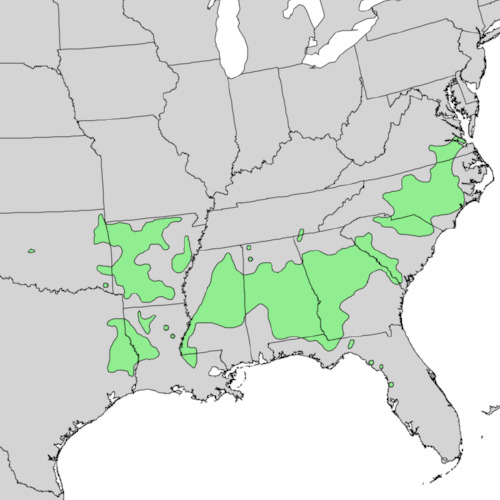 The range of Southern sugar maple (Acer barbatum). Growing as far south as Texas and Louisiana, it contains resilient genetics that could help northern sugar maple survive. Growing as far south as Oklahoma, Florida, and Mexico, these are all sugar maples that can handle highly adverse conditions while also providing sugary sap. Planting these in the North now can help ensure the survival of a maple syrup industry in the future, while also introducing adaptive and heat-tolerant genetics to the northern sugar maple, potentially imparting resistance to major climatic changes. Additionally, a number of cultivars have been found to perform well in southern cities, meaning they hold good potential to survive the future climate conditions of the Northeast. These include: ‘Autumn Splendor’ (a selection from the ‘Caddo’ ecotype), ‘Belle Tower’, ‘Bonfire’, ‘Flashfire’, ‘Green Mountain’, ‘John Pair’ (another ‘Caddo’ type), ‘Legacy’, ‘Oregon Trail’, ‘Plains’, ‘Sandersville’ (likely Acer barbatum), and ‘Steeple’. It is also important to diversify and establish other tree species that can be tapped for sap and stand good chance at performing well in a changing climate. Black walnut (Juglans nigra), Silver maple (Acer saccharinum), birches (including the particularly heat-tolerant river birch, Betula nigra), and hickories (Carya spp.) are all capable of producing marketable sugar sap, and are adapted to a more southern climate while capable of growing as far north as Canada and New England. Hickory bark can also be cleaned and toasted to add flavor and value to other syrups. Hickories and birches frequently grow in the same places as sugar maples, making them a good addition to any sugar bush. Hundreds of millions of dollars are spent every year in the United States and Canada on maple syrup production and consumption. This industry is immediately threatened by climate change, and its best chance at survival could be establishing and evaluating southern-type sugar maples now in the Northeast - particularly in cities. These trees, along with other species that can be tapped for syrup production, could be the future of this industry - further demonstrating how assisted migration can make economic and ecological sense, especially for small-scale growers. Anyone with a woodlot, small farm, or even a large yard can plant these varieties today and ensure their ability to produce sweet syrup for generations.